A speedy summoner, Hayden Seer. Hayden Seer was an aspiring artist in the state of Washington. As a child, Hayden discovered he can make his doodles come to life and be his playmates. These were fairly harmless and were mainly used to entertain himself with, until upon his teens, when preparing for an upcoming gallery, his pictures came to life and ran rampart throughout the gallery. Hayden's parents, office workers for the the Loman Organization, brought Hayden to the Loman Institute where he would better understand his ability. However, Hayden's ability is a rare case, as summoners usually make contracts and call forth existing entities, not create them from thin air. This puzzle led many Mages within the Loman Institute to learn from him, yet Hayden is still trying to understand the full extent of his abilities through trial and error and from adapting the current tenants of magic and applying them to his particular form of magic. As a Mage Agent of Loman, Hayden is a field operative, like Deidra Edelweiss, who employs magic as their primary weapon in combat, yet as a Mage, Hayden also works as a Mage counselor and researcher in studying the arcane arts. 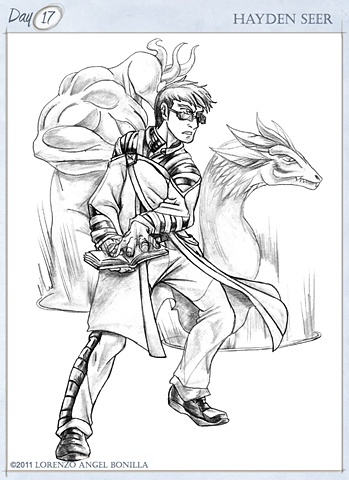 Abilities: Hayden is a specialist in a rare form of summoning magic; where he summons images that are his own creation. As such, Hayden carries around a portfolio book with drawings that he has drawn and summons them via a blood seal offering. The creatures that Hayden summons exist as long as Hayden is willing to offer the blood for their continued existence as size determines the blood offerings, as a larger creature will require more blood and a shorter duration compared to a smaller creature and a longer time limit. As such, Hayden usually keeps his summoned creatures between 90 seconds to 15 minutes summons no more than three creatures, as such any longer or any larger and Hayden begins to feel the effects of blood loss immediately. Hayden is also proficient in other fields of magic, particular sealing, barrier, and not surprisingly, summoning magic. Hayden also understands tracking magic and light healing magic to cope with blood loss and to heal himself from fatigue. Aside from summoning magic, Hayden is adept at kinetomancy, speed magic, where Hayden accelerates his reflexes so as to be a more evasive target to opponents, add to his combat training, and Hayden is a capable fighter, when not summoning creatures. Hayden has completed basic small arms and close quarters combat training, so he is capable of hand to hand and using small arms weapons. Creation: Hayden was one of the first of three characters that came to me in my idea for Loman. It was a dream I was reading or watching a show with these "supernatural agents" where there was an element witch, an art summoner, and a legendary weapons specialist. Hayden was going to be a POV character as he will be introduced to the team around issue two. The name came around just using Hayden and the mythical troupe of a seer. His outfit was modeled after the dream, where I saw such a robe, yet the detailing is modeled after a manga characters coat I saw. Originally, Hayden's sketchbook was to be strapped to his back, but I changed it to be more portable and it will be attached to his hip, like a personal firearm. The creatures were going to be based around stylized or exagerrated representations of my own library of characters, so as to make it my own personal Easter Egg of ideas.